A whole child approach to education ensures that each child, in each school, and in each community is healthy, safe, engaged, supported, and challenged. With our interactive Whole Child Examples Map tool, you can find examples of schools and communities worldwide that are implementing a whole child approach to education, including these early childhood education programs. Each example highlights a program, focus, or achievement and includes links to more information. Dubbo School of Distance Education has been designated a MindMatters school by whole child partner Principals Australia Institute. The school, centered in Dubbo, Australia, provides individualized distance education options for students in preschool through 12th grade who are either unable to attend a face-to-face school or are pursuing a course of study that is unavailable at their local school. Washington Drive Primary School, located in the New York Harborfield Central School District, fosters students' self-reliance and positive attitudes toward school and learning. The early education program, specifically for 5- to 8-year-olds, provides a wide variety of developmentally appropriate opportunities in which children create, explore, discover, and learn. Rarely does one find a school, particularly a large elementary school, so student-focused. Beginning in kindergarten, students at Bell's Crossing Elementary School in Simpsonville, S.C., are taught to be responsible for themselves, set academic and personal goals, track their own progress, and be prepared to explain the data to anyone who asks. Berkeley Elementary School, a rural Title I school in Moncks Corner, S.C., serves 670 students from 4-year-olds in preschool through second grade. For students with diverse ethnicities (52 percent minority) and a wide socioeconomic range, Berkeley Elementary School strives to provide a character education program that teaches the values of acceptance, compassion, friendship, respect, and self-discipline. Renfro Elementary School in Illinois defines character to include thinking, feeling, and doing and takes a very comprehensive, intentional, proactive approach to character education. Whether it be the analysis of needs assessment data or the selection of coalition-led, evidence-based prevention and intervention programs, it's clear that Sylacauga, Ala., has an innate desire to better its community. Exceptional community-based services for youth have emerged in Franklin Northwest Supervisory Union in Vermont thanks to its cultivation of partnerships. With connections from regional planning commissions to indigenous organizations to local hospitals, the community provides strong programs for youth across a spectrum of ages. Last month, 100 new schools and communities were added to the map. 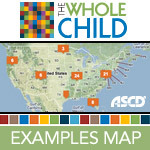 Identified by ASCD or whole child partner organizations, these school and community examples reflect a commitment to a whole child approach put into practice. Take a look, share the links, and talk about the schools and communities. Keep coming back as we change the perception of what a good school is, one school, one district, one state, and one country at a time. Would you be able to provide me with an email address, as I have a few questions on the promotion of physical activity for my final year project at university?